For decades, entrepreneurs have eyed the deep sea for its wealth of metals, but only in the next few years will the United Nations finalize rules for exploiting these resources in international waters. The monitoring campaign, which is particularly focused on the sediment plume the collector creates, will play a vital role informing these regulations. 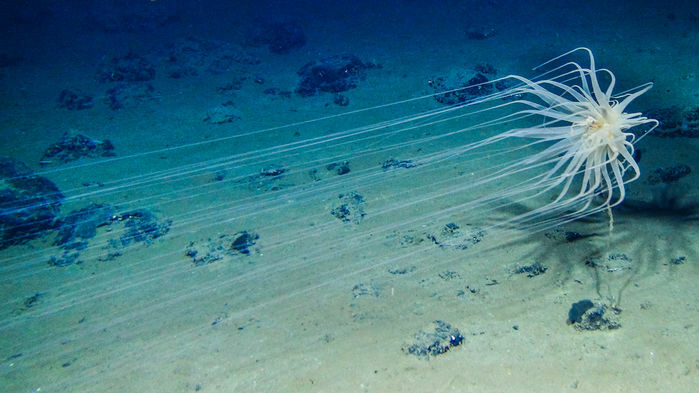 Ecologists worried about the effect of the treasure hunt on the fragile deep-sea organisms living among and beyond the nodules should get some answers, too. An independent group of scientists on the German R/V Sonne will accompany GSR's vessel to monitor the effect of the Patania II's traverses. The European-funded effort, called MiningImpact2, will inform regulations under development for seafloor mining, says James Hein, a marine geologist at the U.S. Geological Survey in Santa Cruz, California. "That work is critical." Since the 1970s, interest in deep-sea mining has waxed and waned with commodity prices. A decade ago, companies were focused on sulfides, copper-rich deposits that form from the mineral-laden hot water gushing from hydrothermal vents. But a plan to mine deposits off Papua New Guinea has met with opposition because the vents are scarce and fragile, and they host unusual life forms. "They are such weird, unique ecosystems," says Andrew Thaler, a deep-sea ecologist who tracks the industry at Blackbeard Biologic, a consultancy in St. Michaels, Maryland. As a result, he says, "It's politically harder to get more mining licenses." The nodules, however, are abundant, and they are rich in cobalt, a costly metal important for many electronics that is now mined in the forests of the Democratic Republic of the Congo, a conflict zone. If Earth had never been mined and you had to choose between the rainforest or seabed, "you'd absolutely go to the sea floor," Thaler says. "No brainer." The nodules form on deep abyssal plains where sedimentation rates are low, allowing metal compounds dissolved in seawater to encrust a nucleus, like a shark tooth or a rock, over millions of years. Microbes aid the process, especially where they are nourished by nutrients drifting down from life-rich surface waters, says Beth Orcutt, a geomicrobiologist at the Bigelow Laboratory for Ocean Sciences in East Boothbay, Maine.